Can you believe it's November already? I've changed out my favorite corner again, what do you think? My sister in law is in the middle of rearranging rooms at her house and she gifted me with this amazingly comfortable chair. I loved the look of the white wicker here but I knew for practical comfort we would probably need to find something more substantial. It took some tweaking but I think I have everything jelling together again. I've moved the wicker chair back into my studio where it was sorely missed by one little white dog and tucked the ottoman in a corner for extra seating as needed. 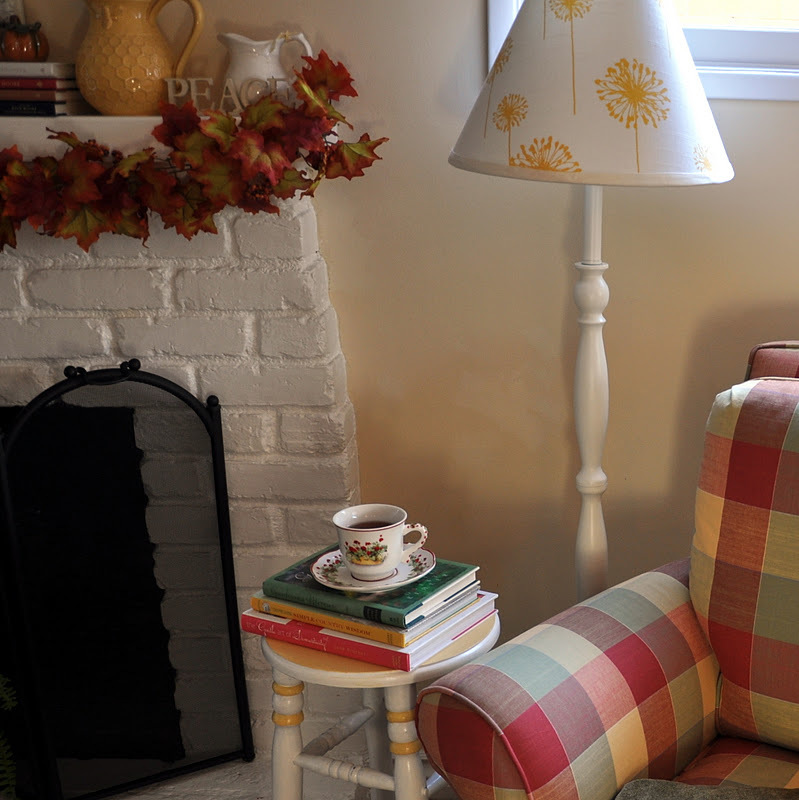 Couldn't you just grab a magazine and a hot cup of tea and cozy up here for an hour or two? I am a feet tucker inner...that's how I test furniture for comfortableness. If I can sit with my feet tucked under my legs then we have a winner. Let me tell you folks, we have a winner in this chair. Now all I need is for the weather to cool down enough to light a fire in the fireplace! I made some good progress on the living room redo last weekend and I'm just about ready for the big reveal. I have to admit that I really love the way it's turning out and I can't wait to share it with you. looks comfy, we all have to have a little corner of the world just for us, dont we? Your little corner is so cute and comfy!!!! Oh, I'm tempted to borrow your magazine for an hour or so. Looks so cozy there. Have a great morning! Very cute! Love the colors. Oh looks so cozy, I could just picture myself sitting (with my feet under my legs) reading your magazine. Bliss!!! Lucky you getting such a nice comfy chair. There is no end to the cuteness of you little corner!! What a wonderful gift! How thoughtful of your sister in law. I love the colors in the fabric... very cozy. Your wee corner is beautiful. Looks like a nice and cozy corner. It makes me want to read my book and sip on some tea! Thanks for sharing. I'm not a foot tucker but a leg raiser on ottomans. Your chair looks so cozy I may have to go have a cup of tea right now! Enjoy your cozy spot - it looks wonderful!! And don't worry, you'll be lighting that fire real soon! What a wonderful chair...I'm so with you on the feet thing! !Your little corner looks perfect! Your corner looks very comfy and lovely. It would be a nice place to curl up with a good book for awhile. P.S. Thank you for visiting my blog, for your kind comment and for becoming a follower. Your little corner looks so cozy and warm. That will be nice in the winter when you can sit next to a warm crackling fire. I like the colors in the chair and the white wicker!! So cozy!! Such a cozy spot. I just love the fabric on that chair. No, I cannot believe it is November already! I could definitely cozy into that comphy looking chair. And a fireplace too-Oh, my goodness. Happy November! Yes, it came so quickly. Thanks for visiting and joing my Sweet Romantic Notions. It was so nice of you. I just got my power back after a nasty New England Nor'easter...Brrr..I love your new chair and it sure would have come in handy the past few day's..reading by firelight and a comfy chair go hand in hand.. I'm now following you too. I will be visiting often.. I love that chair, the pop of color really warms up the space. Lovely!! I love the colors in that chair. It sure looks like it's a comfy one. I really like your chair. I used to have couches that looked similar to that, and I miss them. Your little corner looks so relaxing. I love the warm colors of this chair, and it looks so comfy:>) I always sit with my feet up on the furniture too! You lucky girl! I love that chair! I love how the colors of your new chair match the stool and books. Perfect. Why yes I could get cozy there for a nice hot cup of tea! I love the chair, and it would go fabulously in my home too!!!! I have a copy of the Autumn Cottage magazine in my powder room, and I just want to tell you that your home, decorating, and vignettes would fit perfectly in that magazine. 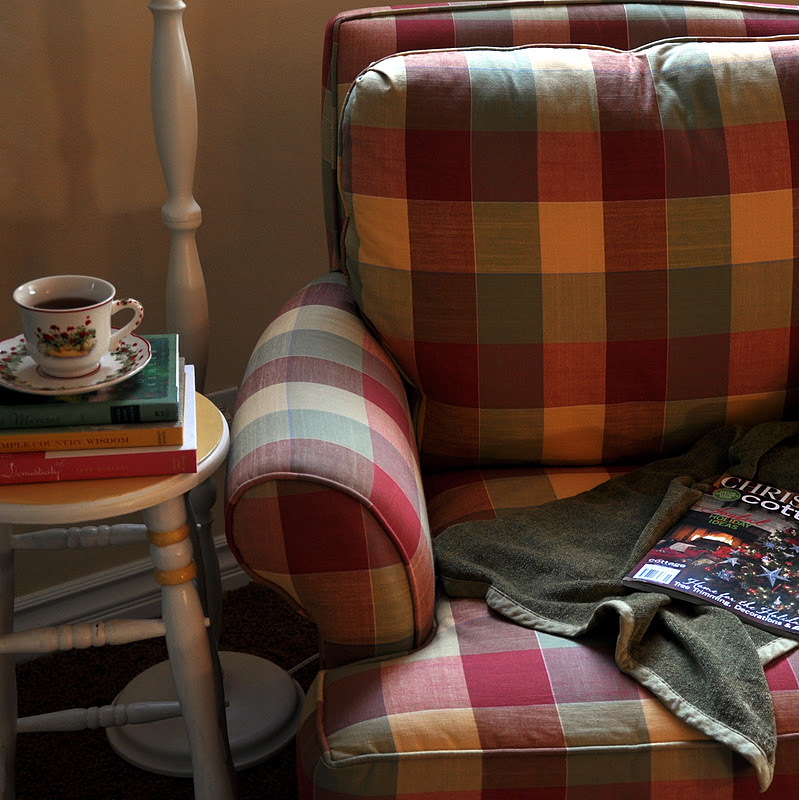 I like how you have the magazine laying there with an afghan, and a cup of coffee. 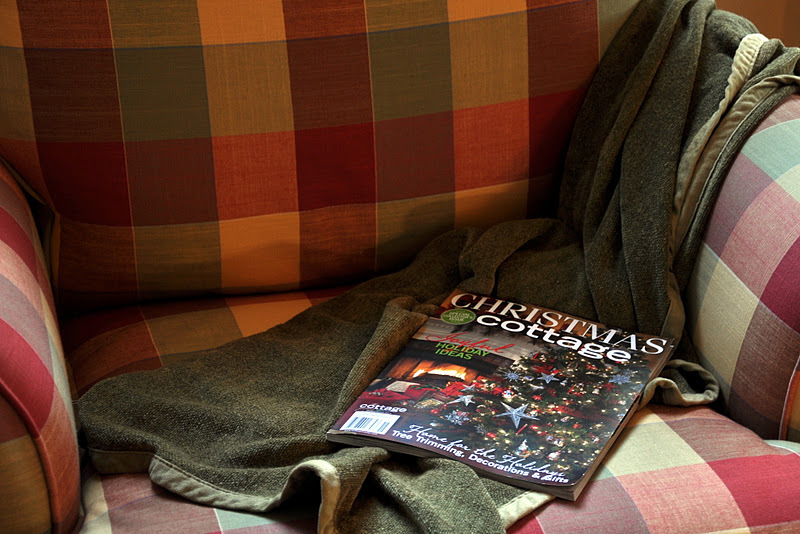 "Cozy" would be the way I describe you and your home, as well as that gorgeous, well-done magazine. I like your cozy corner of the world.